Dr. Eugenie Brunner analyzes the differences between a surgical and non-surgical nose job, revealing the benefits and drawbacks of each technique. Princeton, NJ — A new cosmetic trend called a “Liquid Nose Job” styles itself as an alternative to rhinoplasty for certain people. 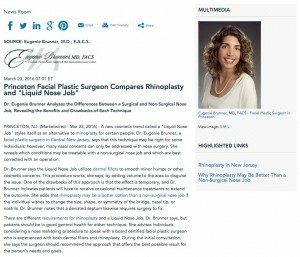 Dr. Eugenie Brunner, a facial plastic surgeon in Central New Jersey, says that this technique may be right for some individuals; however, many nasal concerns can only be addressed with nose surgery. She reveals which conditions may be treatable with a non-surgical nose job and which are best corrected with an operation. Dr. Brunner says the Liquid Nose Job utilizes dermal fillers to smooth minor humps or other cosmetic concerns. This procedure works, she says, by adding volume to the area to disguise the issue. One of the drawbacks of this approach is that the effect is temporary, and Dr. Brunner indicates patients will have to receive occasional maintenance treatments to extend the outcome. She adds that rhinoplasty may be a better option than a non-surgical nose job if the individual wishes to change the size, shape, or symmetry of the bridge, nasal tip, or nostrils. Dr. Brunner notes that a deviated septum likewise requires surgery to fix. There are different requirements for rhinoplasty and a Liquid Nose Job, Dr. Brunner says, but patients should be in good general health for either technique. She advises individuals considering a nose reshaping procedure to speak with a board certified facial plastic surgeon who is experienced with both dermal fillers and rhinoplasty. During the initial consultation, she says the surgeon should recommend the approach that offers the best possible result for the person’s needs and goals. Certified by the American Board of Facial Plastic and Reconstructive Surgery and the American Board of Otolaryngology, Dr. Eugenie Brunner is a fellowship-trained facial plastic surgeon practicing in the Central New Jersey area. She earned her undergraduate degree from Rutgers College, followed by her medical degree from the Robert Wood Johnson Medical School. Dr. Brunner is an active member of the American Society for Laser Medicine & Surgery, and she is a six-time recipient of the Castle Connolly Top Doctor Award. Dr. Brunner is available for interview upon request.